Rubick, the Grand Magus, seems simple and straightforward at first glance. His non-ultimate abilities include a short stun, a chain lightning-like nuke that also reduces the attack damage of anyone caught in its wake, and an aura that increases the magic resistance of allied units or decreases that of the enemy—depending on which mode is selected. He does this with his signature skill Spell Steal, which grabs the target’s last-used ability and adds it to a fifth ability slot in Rubick’s arsenal. The stolen spell retains its levels, and is kept in his kit for a duration that is dependent on Spell Steal’s own level. Rubick is free to use the spell until the duration expires, or until he is killed. Even without going into too much detail about it, the potential of Spell Steal to turn games around is abundantly clear—with legendary Rubick players like Xu “fy” Linsen and Yazied “YapzOr” Jaradat are often found making tournament highlight reels with it. Unfortunately, Spell Steal truly is the only unique part of Rubick’s design. The rest of his traits are average at best, and without Spell Steal he would be a completely mediocre support hero with the fragility expected of those in the role. His overall effectiveness also largely depends on the opposing team’s draft, making it difficult to simply place him in just any lineup. And of course, he happens to be one of the most demanding heroes in the clutch. Even with his shortcomings, though, the reason to pick Rubick is obvious. If there is a hero on the other team with a high-impact ultimate that you can exploit yourself, there may be a place for the Grand Magus in your draft. Thanks to his uncomplicated kit, Rubick’s skill build is very easy to memorize. His first two abilities are all you really need in the early game, with Telekinesis generally being the first that you should take. It can, after all, mean the difference between life and death when contesting the bounty runes, and is basically your only escape mechanism throughout the laning phase. Fade Bolt should be the first priority when it comes to maxing skills out, though, as the harassment and killing potential it brings to the table in the early game should not be ignored. It even functions kind of like Bane’s Enfeeble ability, reducing the attack damage of anyone aiming to take last hits in the lane. Combine with Telekinesis and your lane partner’s other abilities for maximum effect. Null Field should only be taken once Telekinesis and Fade Bolt are both at max level. Truth be told, its scaling really isn’t all that great, and sometimes it’s difficult to even notice its impact—so it should be left alone until Rubick hits Level 11. Naturally, Spell Steal should be taken at every ultimate level, in order to increase its steal duration and lower its cooldown as soon as possible. As a support hero, Rubick will generally be expected to buy the essentials such as Wards, Dust, and the Courier. You will probably have to suffer through buying consumables like these until your cores are able to get their items, so just be prepared to be a Ward slave for a while. 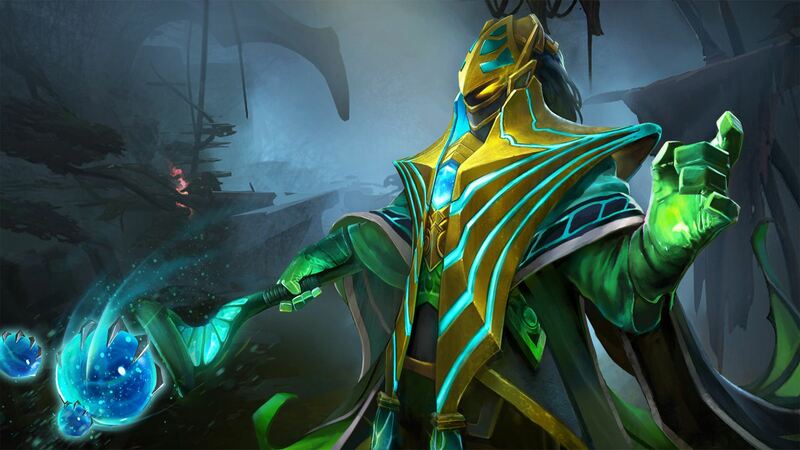 In the early game, cost-effective items such as Arcane Boots (Rubick needs plenty of mana) will be your best friend. When you do get an opportunity to invest into actual equipment, though, playing Rubick becomes a lot more fun. Considering how dependent Rubick is on proper positioning, mobility items like Blink Dagger and Force Staff are very effective on him. Both items can be used to quickly close the distance on a target, or escape from certain death. For the most part, both items alleviate his slow movement and fragility at the same time. Eul’s Scepter of Divinity is another good choice, thanks to its bonus movement speed and solid disabling power. Since it can be used on oneself, Rubick can escape gank attempts by sending himself up in the Cyclone (so that he cannot be targeted or damaged normally), followed by a quick blink or Force Staff out. The rest of his inventory will pretty much consist of situational picks. Aether Lens increases his cast range, and can be assembled from the components of Arcane Boots. You might also want to opt for an Urn of Shadows upgraded into a Spirit Vessel, in case there are heroes on the other side that are particularly dependent on passive regeneration or healing. Pipe of Insight reduces incoming magic damage even further when combined with Null Field, and is useful against nuke-heavy lineups. Buying a Ghost Scepter is a good idea against right-click carries. Glimmer Cape can be used as a cheap escape mechanism, which thankfully can also be cast on allied heroes. Though Rubick does have an Aghanim’s Scepter upgrade, it can be quite difficult to reach due to its high cost compared to his usual core items. If you are able to secure one, however, you may be able to find yourself outgunning enemy heroes at their own game, using their upgraded spells against them. Because of his rather high skill ceiling, defining a bread and butter combo for Rubick during teamfights can be tricky. The sequence of spells can vary depending on what spell you might have stolen in the last couple of minutes or so, and his positioning will generally come down to game sense and reaction time. That said, you will usually want to open with a mobility item into Telekinesis, in order to quickly disable a key target and bring them closer to your team. If they might have a particularly valuable spell to pilfer, go ahead and use Spell Steal on them. Of course, whether or not you actually get the spell you want will be dependent on either luck or your own timing, so be on the lookout for enemy heroes that use their best skills willy-nilly. Of course, you will generally want to stay out of harm’s way, so try to position yourself accordingly. Since Rubick has no natural escape mechanism other than Telekinesis, targeting him as a group generally works wonders. He can only lift one of you, after all, unless he has a stolen spell that allows him to disable multiple heroes at once. Removing him from a teamfight first also removes his most recently stolen spell from his arsenal, which creates some “downtime” for him as he comes out of respawn. Both Linken’s Sphere and Black King Bar counter his entire kit, with the former being the less demanding item in terms of commitment. Linken’s Sphere also increases stats way more than BKB ever will, so that bonus is worth the price of admission. Be wary, however, that he can simply use one of his spells to burn the Linken protection, in favor of a more impactful one depending on his target. As for specific hero counters, heroes that can shrug off his spells, silence and kill him quickly, or otherwise isolate him in some way are excellent picks. Clinkz, Legion Commander, Riki, Slark, and Bristleback are just some examples of heroes that do well against him, so consider drafting them if you see Rubick picked early on.